Sometimes, we all need an escape away from reality, to some luxurious all inclusive resort on some paradise island. Right!!?? For us, this paradise island happened to be the most beautiful Bali Island of Indonesia, perfectly situated in the Java Sea. Bali is a nice little ‘hop-and-skip’ away from our home country, making it one of the more popular holiday escape destinations for a lot of Australians! Our excuse for the getaway was to treat our Dad with a relaxing holiday for his 60th Birthday. We (his kids) felt that it was time to give back to a man who had worked incredibly hard to be the head of the house to what I believe must be the best family ever! It was our way of showing appreciation, love and thanks back to a very inspirational man. Now as grown ups, we could all put some money together to buy him and my Mum a well deserved break away from life and turn it into one massive family holiday getaway. And what a magical week on Bali Island in our Nusa Dua Hotel it was!! Where is this All Inclusive Bali Resort? 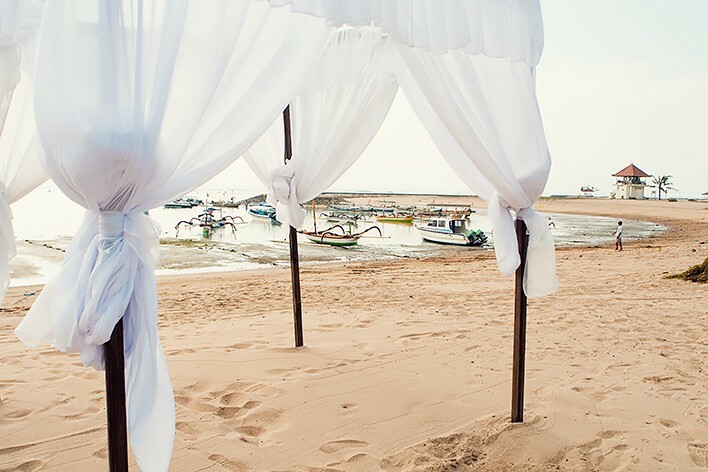 For this incredibly special occasion, we chose to stay at the Sol Beach House Benoa*, a hotel located in Bali’s tropical haven of Nusa Dua. 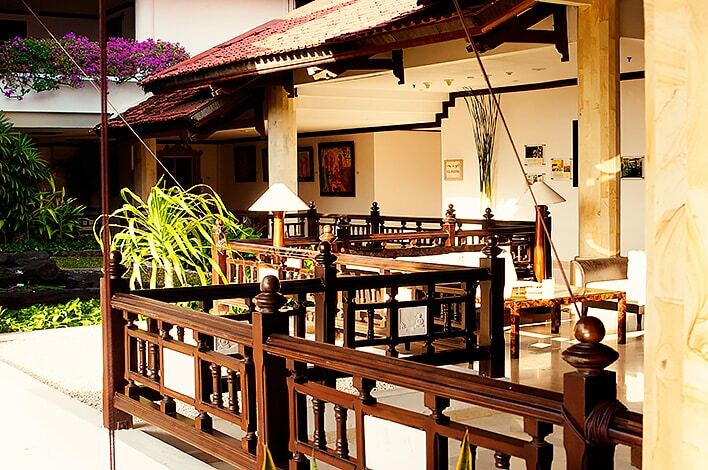 The hotel itself is in a perfect location within easy access from the Airport (18 min) and within an easy driving distance to the famous Kuta region, but yet nicely tucked away from the busyness found there to provide you with an incredibly peaceful and relaxing stay. It is a great hotel for families! 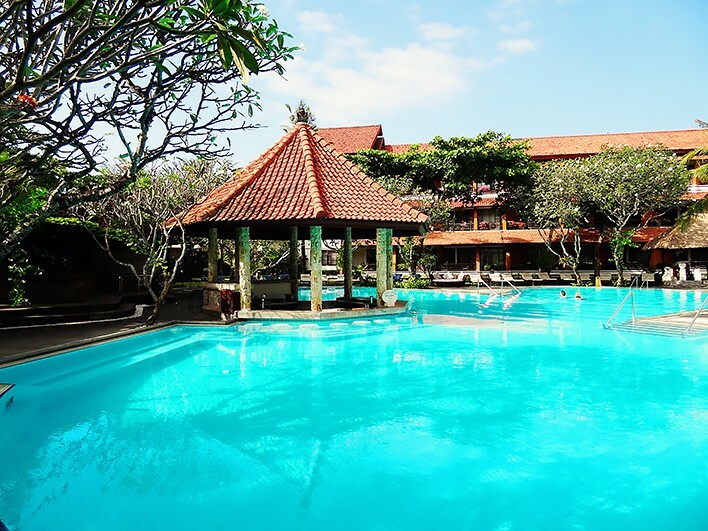 But if you want, you can compare it to our list of the best resorts in Bali for families here. 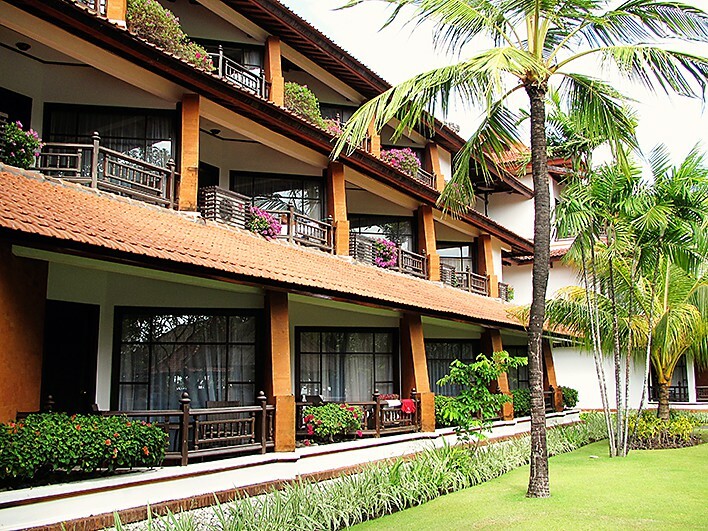 We checked in to our Nusa Dua hotel, the Hotel Sol Beach House Benoa*. 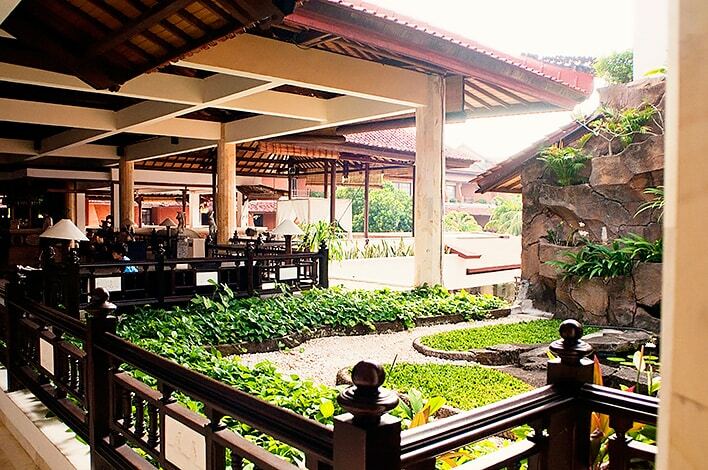 As we arrived we could hear Balinese themed music pouring down the luxurious entrance to the resort. We were welcomed in an incredibly friendly manner with some delicious juice concoction, whilst we watched some Balinese girls in costume perform a traditional dance. 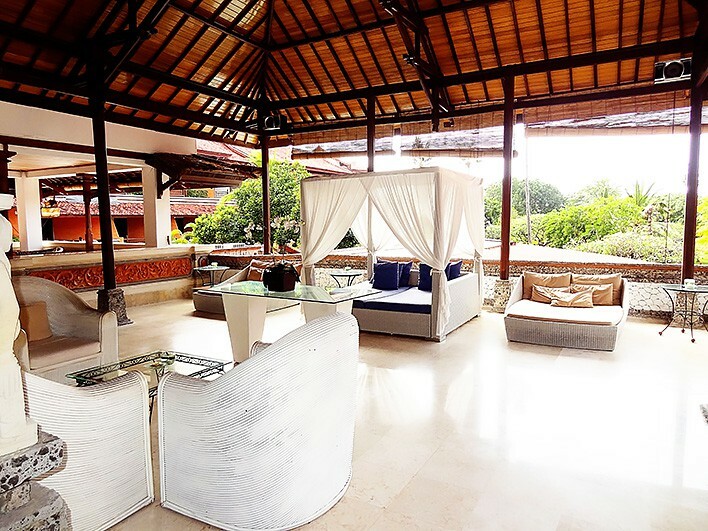 Everywhere around us, we saw luxury, with glorious Balinese daybeds right there in the entrance room, with stunning Balinese-inspired architecture in the detail and design of the building. We were happy … we were excited and we couldn't wait to check in to our rooms. 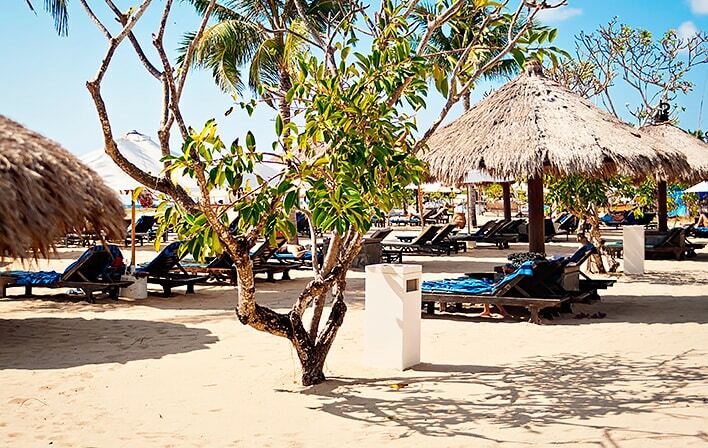 Sol Beach House Nusa Dua has 36 guestrooms, 54 premium rooms, 32 suites, and 5 family suites on offer. They cater for individuals, couples as well as families. I chose to stay in one of their guestrooms (Melia Rooms) which was the most affordable room on offer. Even though the room was the ‘cheapest’ option, I was still very pleased to find my room to be elegant in design, comfortable and spacious enough for my needs. The only downfall to my room was that I had a view over the markets that run along the one side of the hotel, and it could be a touch noisy at night. 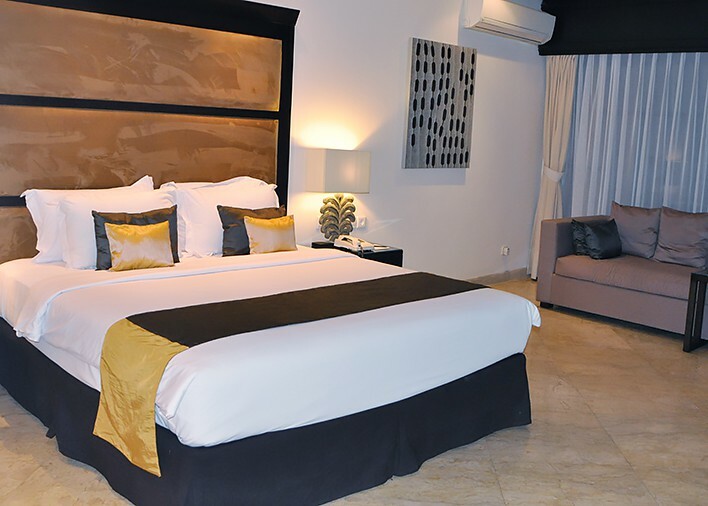 As I didn't spend much time in my room itself I didn't find it to be a huge issue, however it might be worthwhile investing a touch more money to get one of their beautiful pool or garden view rooms! As well, can I just say that their family suite looks like pure and utter paradise!! Check it out the website!! I think that my absolute favourite part about Sol Beach House Benoa Bali has to be the swim-up bar in the pool!! I mean … how do you possibly go to some paradise island and NOT book in to stay at a resort with a swim up bar!! It is a non-negotiable!! And this swim-up bar was simply perfect!! We spent plenty lazy afternoons simply hanging out on the underwater bar stools, whilst sampling or possibly working our way through their entire cocktail menu! The pool is lovely and large in design and as the resort also boasts its own section of private beach for sun loungers, we actually found that the pool area was usually pretty empty and really loved having the whole area to ourselves! You can borrow some pool towels, so no need to bring your own! A very short distance away from the pool area, you will find yourself on the white sand of the private beach area dedicated to this resort. 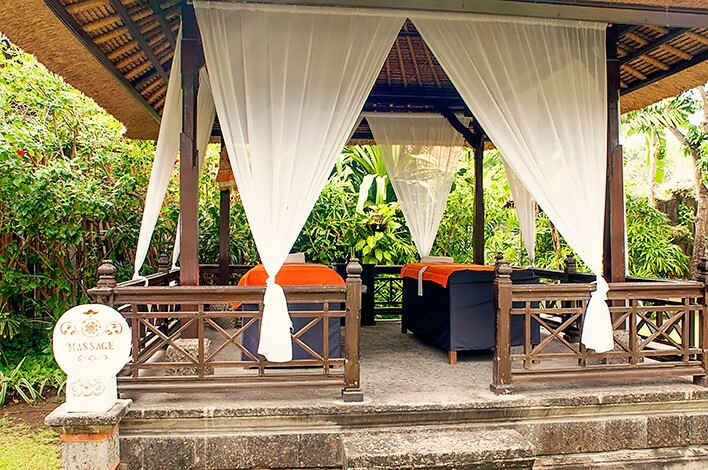 Here you will find the perfect scene of grass-roofed pergola’s providing shelter away from the harsh Bali sun. You can make yourself comfy on one of the sun-loungers found here. We actually realized that if you head out before breakfast and left your towel on your chosen sun-lounger, you are in essence ‘booking’ your lounger for the day. It is perfect to just lay here and soak in the atmosphere. In the early morning you will find Balinese out on boats with nets, trying to catch some fish for the day, whilst in the late afternoon, we found that with low-tide we could go and and explore the rocky area that lies under the water to discover all sorts of amazing sea creatures and crabs! The kids loved running around on an adventure here. In all honesty, we didn't really go for a swim in the beach here. It is not like the ocean we are used to in Australia, where the waves come bouldering down and where you will find soft sand under your feet, but more a subdued version of the ocean with no waves and rocky bits and pieces under your feet to walk over! Regardless of this, there was heaps of people in the water, but we preferred lounging out here on the beach and then making our way a short distance back to the pool to refresh and cool down! The beach area is a lovely place to go for a late afternoon walk, with a beautifully designed footpath making its way along the front of various luxurious Bali hotels. Perfect for an afternoon stroll to sight-see what else is around. We loved grabbing some photos of the various Balinese cultural sights, look out for the awesome Balinese boats! 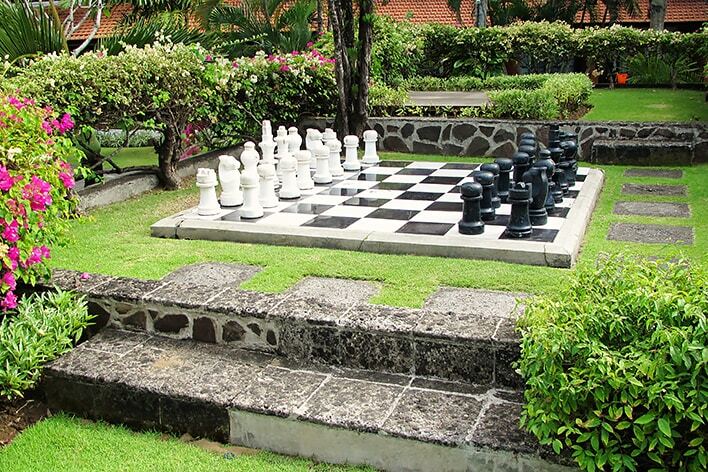 Further, the resort also had heaps of various activities on offer to keep you busy. So look at for ‘what is happening each day’. We were fortunate enough to watch an incredibly fascinating cultural performance whilst we were there. Whilst we didn't completely understand the ‘gist’ of what the performance was about is was a really interesting way to get a look into the Balinese culture. There are also various activities to keep the kids busy such as an area for volleyball, a kids centre as well as a giant chess set! One of the beauties of Asian destinations is that you can treat yourself to all sorts of luxurious spa treatments and massages at a fraction of the cost of the services back home. So finding a hotel that offers these sorts of luxury is definitely a bonus in my books! Here at the Resort, you can treat yourself to relaxing therapies without having to step a foot away from the resort grounds. The spa offers therapies designed topamper you with a selection of rejuvenating options including jacuzzi, reflexology, massage, and a host of facial and body treatments. We ended each and every day with a massage …. because WHY NOT!!! and you should too! 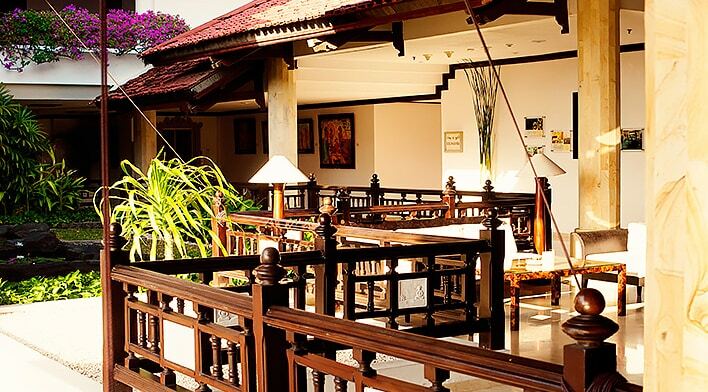 Here at Hotel Sol Beach House Benoa, you are provided with a variety of restaurants as well as cuisine options! The Amarta Restaurant is an indoor Italian restaurant which offers a wide selection of antipasto, pasta, pizza, and risotto among other delights. El Patio starts the day off with a scrumptious American breakfast buffet (although look out for those delicious crazy looking Balinese fruit!!) and serves up the rest of the day with international cuisine. Menega Seaside Restaurant, where diners are treated to international buffet lunches and themed buffet dinners, this one is definitely for the buffet-lovers!! The Ayodya Lobby Bar provides the perfect place to meet up and socialize after busy days of exploring – open from after lunch till late into the evening. Of course I already mentioned the Nelayan Pool Bar which offers incredibly delicious ice-cold drinks whilst enjoying the pool! 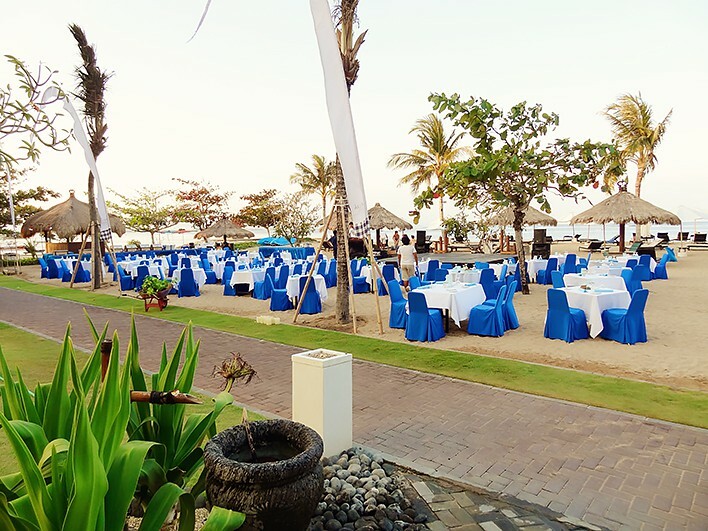 And lastly, they also hold special buffet dinners on various nights which they set up right on their beach sand – How cool is that!!! This Nusa Dua Hotel is situated away from the hussle and bussle of Kuta and privates you with a quiet peaceful oasis of luxury. The hotel has a swim-up bar in the pool – ENOUGH SAID!! There is no need to leave the hotel grounds, as they offer a variety of cuisine options on grounds! You can be pampered and get treated like royalty in their in-house SPA. The hotel is perfect for both romantic couple escapes as well as for family holidays! You can find a gateway to fun water activities right at the oceanic front door! 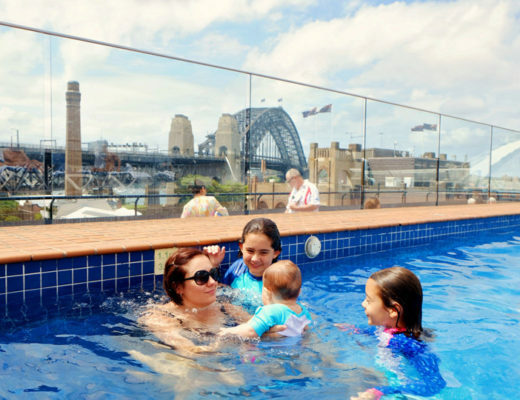 Rooms start from AUD $172 p/n or US $126 p/n – This includes a delicious and yummy buffet breakfast each morning. Suitable as either a parent (couples)-escape or for a family stay. 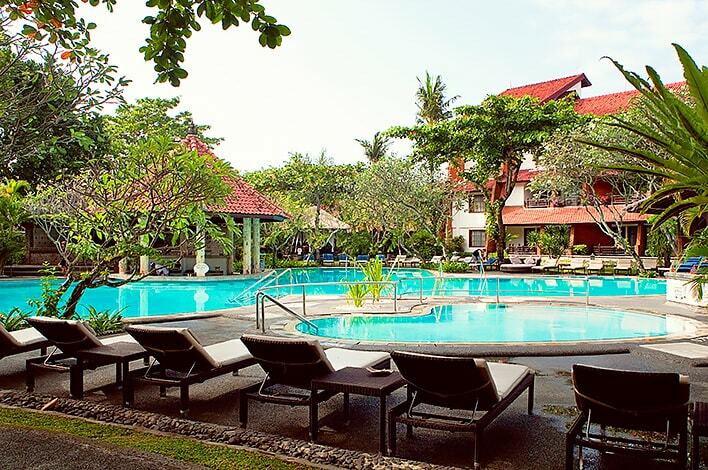 This Nusa Dua Hotel is highly recommended by us! Have you been to Bali? Where did you stay? Would you choose to stay at an All Inclusive Bali Resort? * Please note, this post is not a sponsored post. We paid for our own accommodation and simply wanted to share our experiences with our readers as we totally loved our stay with Sol Beach House Benoa. * Denotes affiliate links. Thank you so much for writing this article! I am planning on staying here on my honeymoon later this year and glad to hear it had such a great endorsement from you! Hi Melody, that is great to hear!! Congrats on the engagement! 🙂 I’m sure you will have a great time there! I loved the swim up bar in the pool haha! !